TheraCool® Gel - 100% Gel Infused Foams. Sleep sets using our advanced Gel technology foams provide maximum comfort and greater pressure relief with the added benefit of wicking away heat from the body for a cooler, more restful and deeper sleep throughout the night. An open-cell, visco-elastic foam that responds to body weight and temperature while adjusting to individual contours to reduce pressure on sensitive areas of the body. MemoryTouch® - the ultimate comfort material! Individually Wrapped Nested Coil Units are designed to flex and conform independently of each other, reducing motion transfer and helping to eliminate partner sleeping disturbance. TheraFoam™ Enhanced Foam Encasement provides tremendous edge support for a smoother transition of getting in and out of bed, as well as providing additional sleeping surface. Our solid wood, hand-built foundations, are made in the USA. These foundations are engineered to provide the proper support over the lifetime of each mattress. 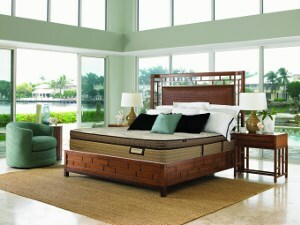 The Tommy Bahama Salty Kisses ET Twin Euro Top Luxury Mattress and 9" Amish Hand Crafted Solid Wood Foundation by Tommy Bahama Mattress at Baer's Furniture in the Ft. Lauderdale, Ft. Myers, Orlando, Naples, Miami, Florida area. Product availability may vary. Contact us for the most current availability on this product. 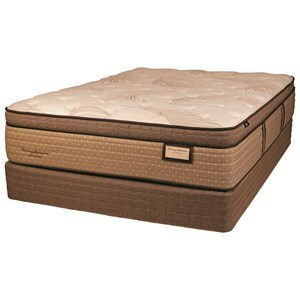 600HP-T Twin 9" Amish Hand Crafted Solid Wood Foundation 1 9"
True Luxury would be a good way to describe the mattresses in the Tommy Bahama Mattress Collection. Using the latest technology in advanced pressure relief, durability and heat reduction, these mattresses are built for both comfort and longevity. Enjoy the cooling effects of the TheraCool® Gel - 100% Gel Infused Foams and the conform-ability of the Individually Wrapped Nested Coil Unit, which is encased with TheraFoam™ Enhanced Foam for a firmer edge and additional sleep surface. Experience the feeling of a luxurious sleep set and what a deep sleep can do for your day! The Tommy Bahama Salty Kisses ET collection is a great option if you are looking for Mattresses in the Ft. Lauderdale, Ft. Myers, Orlando, Naples, Miami, Florida area. 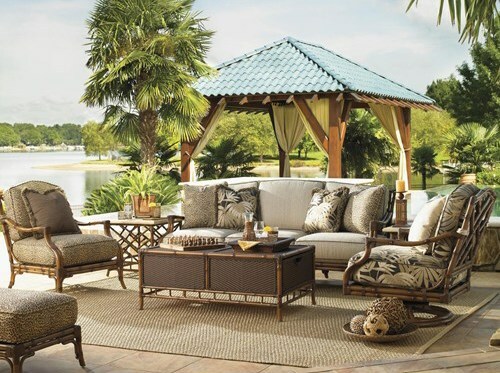 Browse other items in the Tommy Bahama Salty Kisses ET collection from Baer's Furniture in the Ft. Lauderdale, Ft. Myers, Orlando, Naples, Miami, Florida area.